Chelsea forward Olivier Giroud has dropped a second hint in a matter of days suggesting that he could be set for an exit this summer. The 32-year-old has made 34 appearances so far this season, scoring 10 goals and providing seven assists for Maurizio Sarri’s side. However, nine of those goals have come in the Europa League where he has been a regular starter for the Blues, but in contrast, he hasn’t started a Premier League game since December. As noted by The Sun last week, the French international publicly revealed his frustration over his current role at Stamford Bridge, and he has reiterated that stance just days later and has perhaps escalated it by dropping a huge hint that he could consider a return to France this summer. “Of course it’s frustrating,” he French radio station RTL, as quoted by Sky Sports. “Today, I have the impression there is clearly no competition [for places in attack] since January. 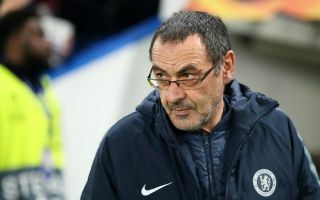 Time will tell if an exit does materialise, as Chelsea may well be desperate to keep hold of their current squad given their transfer ban which applies to the next two windows. If they are unable to replace Giroud, allowing him to leave and losing key depth up front could create a real issue for Sarri, although an exit for loanee Gonzalo Higuain could work in his favour and offer him the chance of a more prominent role. Tammy Abraham is expected to return from his loan spell with Aston Villa this summer though, and so perhaps the issue over competition for places could continue to haunt Giroud.